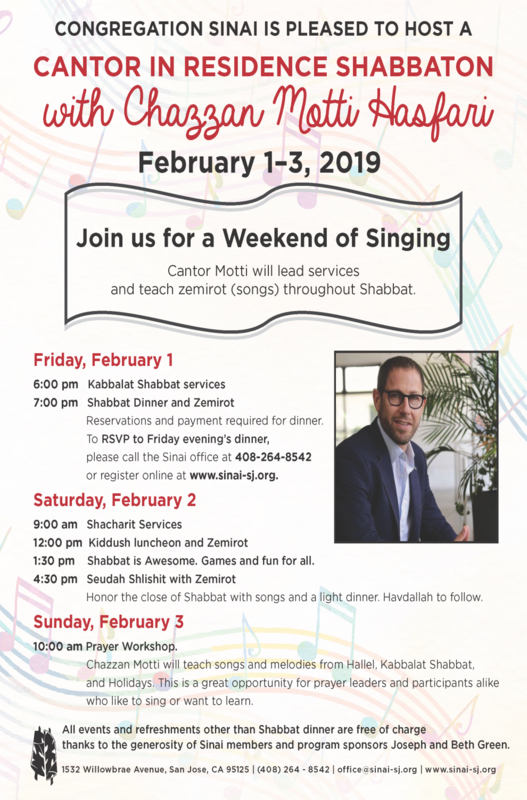 Bring in Shabbat with Kaballat Shabbat Service at 6 pm, followed by dinner at 7 pm. Dinner will be followed by zemirot (Jewish hymns) with Cantor Motti. RSVP to dinner by Monday, January 28. Adults and youths (ages 13+) are $20. Children (ages 5-12) are $5. Tots eat free. $54 family max. All RSVPs after Monday, January 28. Adults and youths (ages 13+) are $24. Children (ages 5-12) are $10. Tots eat free. $65 family max.